Cedar Falls is located in the heart of the Hocking Hills and is the point where Queer Creek takes a 50' plunge into a large splash pool. The falls provide a great focal point to an open canyon that features a shallow wading pool to get your feet wet on a hot day. Cedar Falls, while not quite the same as some of the larger falls in the state, does have the largest volume of water of all the falls in the Hocking Hills area. 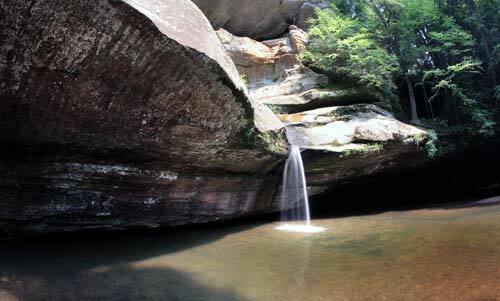 Cedar Falls is at the lower end of the steep sandstone walls of Queer Creek Gorge coming from Old Man's Cave. In fact, you can easily walk the 2 mile trail from Cedar Falls to Old Man's Cave without any problem. Thinking the abundant hemlocks covering the hills in the area were cedars, the early settlers named the falls Cedar Falls— which is ok, Hemlock Falls doesn't quite have the same ring. In 1835, a mill was built above the falls to utilize this water power for grinding grain. 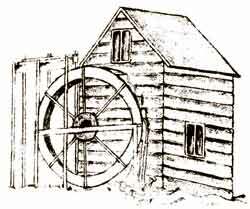 The grindstones of the mill can still be seen above the falls where the upper rim trail bridge is located. Before settlers came and wrongly named the falls, there were numerous Native American's using the area (Delaware, Wyandottes, Shawnees). Salt was found in one of the many caves in the area and they would make an annual trek to the area for gathering salt that was used not for seasoning, but for food preservation. In the early 1800s, a trading post was built just downstream from the main falls that served both the Indians and the early settlers. Parking is located on the high ground with trails that wind through the cliffs until you reach the canyon bottom and an unobstructed view of the falls. Water volume changes drastically depending on the amount of rainfall in the area. There is a trail the moves around the northern rim of the canyon. If you prefer to hike this trail, it is better to park outside of the main park entrance. There is a small unmarked parking area there and the trail head is just east of the parking area. The trail starts at the bridge that crosses over Queer Creek above the falls.